This sparkling 14k white gold engagement ring has a lovely engraved wheat pattern on three sides. 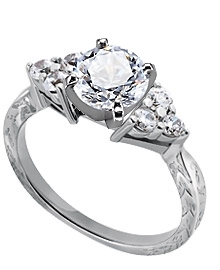 There are three round diamonds on either side of the center setting for a total of six with a color of G-H and clarity of SI for an approximate total weight of .33 carat. You choose the center diamond from Danforth's inventory.